So I have a lv 48 Renamon and I don't know where to train her at. I'm too strong for HellMetalGreymon, but too weak for things like in distorted data village or the dark tower area. 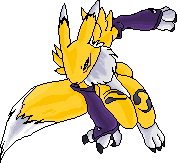 I'm just looking for someone to tell me where I can find vaccine digimon around the levels of 50-54.
you should probly stick around HMG til lv 50 then go to DarkVeemons... Renamon is tough to train cuz Sakuyamon is so weak.